Kanban boards bring continuous improvements in workflow management to many different organizations. They help to successfully conducting all kinds of projects as well as to manage complex processes. Today we would like to present you an example on how to use KanbanTool for managing an online store sales process. As you can see on the picture, we divided our board into 3 main columns: “Order received”, “Payment received”. “Order prepared and sent” and 8 subcolumns: “Order checked”, “Order confirmation sent”, “Payment checked”, “Payment confirmation sent”, “Order picking”, “Order dispatched, “Dispatch confirmation sent”, “Feedback form sent”. We also decided to add two swimlanes that will separate orders from our returning customers and new clients. We did it for two reasons. First of all, we wanted to reward returning customers and offer them a special treatment. We will send our loyal customers (along with the order confirmation) a special thanks for continuing purchases in our store as well as a small gift (together with a product dispatch). Secondly, the information about returning customers should be in our data base and we know that some actions can be done faster. Cards on our Kanban board represent orders. The color of a card helps to identify a category of online store products covered by the order. Icons on a card inform us about the high priority task (red arrow) and about the number of days left to send the dispatch because each order has to be sent up to 14 days after we received an order from a customer. When we point the date in the “Due date” field on card when the dispatch should be send, the icon with the number of days remaining will show up on a card. Attachments help us to keep all documents concerning the particular order in one place. More advanced users can use Zapier to integrate KanbanTool with Shopify. To learn how to do it, please visit KanbanTool integrations page on Zapier. 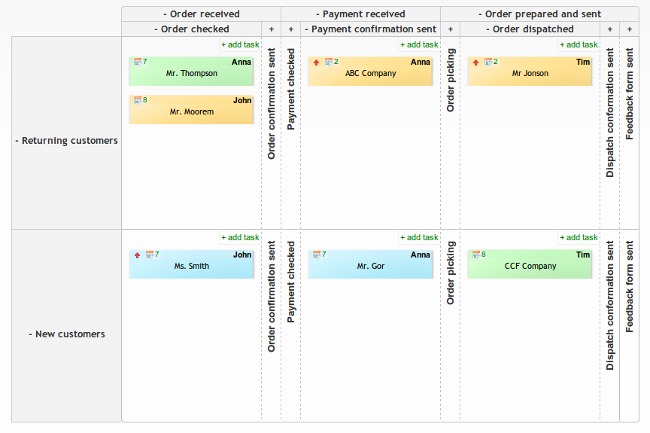 Kanban board is a perfect tool for managing online sales. It can significantly improve sales process management by organizing orders from customers into tasks. This way you can see all orders in one central place. Share with us your story on how you designed your Kanban board and how do you use KanbanTool to achieve better results.